With the WIU Women's Basketball team and coaches looking on, Macomb Mayor Mike Inman reads the proclamation from the City of Macomb declaring March 28 as WIU Leatherneck Women's Basketball Day. The team was recognized at the March 27 Macomb City Council Committee of the Whole meeting. MACOMB, IL -- Macomb Mayor Mike Inman proclaimed Tuesday, March 28 as WIU Leatherneck Women's Basketball Day. Inman signed the official proclamation at the March 27 City Council Committee of the Whole meeting. Inman recognized Head Coach JD Gravina, coaching staff and the 2016-2017 Women's Basketball team at the meeting for their achievements, including an NCAA tournament bid. 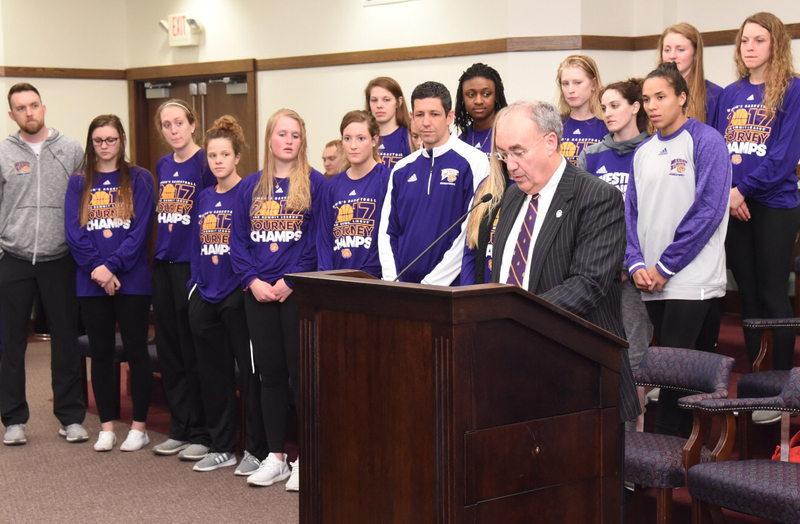 In the proclamation, Inman recognized the team for their numerous accomplishments, including finishing 26-7 overall, capturing the Summit League regular season title, winning the tournament championship and advancing to the NCAA Tournament. The NCAA bid marked the Leatherneck Women's first tournament appearance since 1995. Western Illinois also captured its first Summit League Championship since the 2005-2006 season. The team also set 15 total records during the 2016-17 season, including number of wins, fewest turnovers in a game and set a team record in points (2,640), to name a few. Players Emily Clemens, who captured The Summit League Player of the Year and Tournament MVP award, and Morgan Blumer, who earned Summit League Transfer of the Year and was named to the All-Tournament team, set individual records. Along with them, Taylor Higginbotham and Olivia Braun also received Summit League honors. Gravina was named Summit League Coach of the Year. "I encourage all citizens of this city to join me in recognizing the Leatherneck Women's Basketball team for their accomplishments during the 2016-17 season. We are so proud of you," Inman added.